The firebox is arguably the most important visual element of any complete fireplace system. 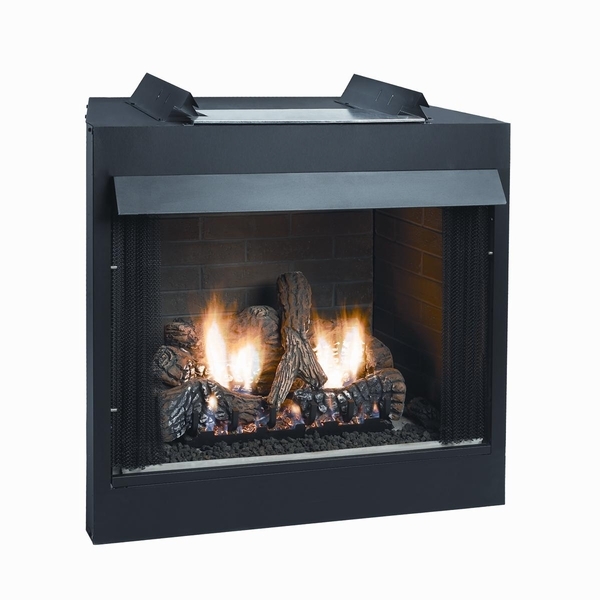 This firebox from Breckenridge offers a great look with its matte back hood and ceramic fiber traditional brick liner. The firebox is vent free for versatility, and features hem bent seams that eliminate the need for screws or fasteners. Since it is manufactured by Empire, you can be confident this firebox has the quality construction for durability that lasts a lifetime. Can a blower unit be installed in the flush mount firebox? A circulating blower may indeed be used with the flush front firebox. Does this firebox have to sit right on the floor or can it have a mantel ledge under it? It can be installed on a supported raised floor. Does this include the ceramic logs? This is strictly a firebox. A gas log set would need to be purchased separately. The opening dimensions of this firebox are 36" x 24 3/8". Can this unit be installed into a dry-walled area with wood studs or do you require a brick surround? This firebox can be framed in a wooden enclosure with minimal requirements for clearances. Please see pages 4-5 of the owner's manual for more information. Can this unit be installed flush against my sheet rock wall? Can I add a marble surround to it and the mantel? Does this unit contain brick ceramic liner? Does the unit come equipped with a ventless gas log set? What size gas log fits inside of the firebox? Yes, this firebox's rear flanges have a zero clearance to combustibles, and yes, any noncombustible material can be used on the face of this firebox up to the opening. This particular model does include traditional brick ceramic liner, but it does not include a ventless gas log set. For our 36" fireboxes, we recommend a 24" ventless gas log set. ProsVery stylish. Doesn't overwhelm the room. Clean looking and easy to install.